Ooooooh, pretty swirly insides! 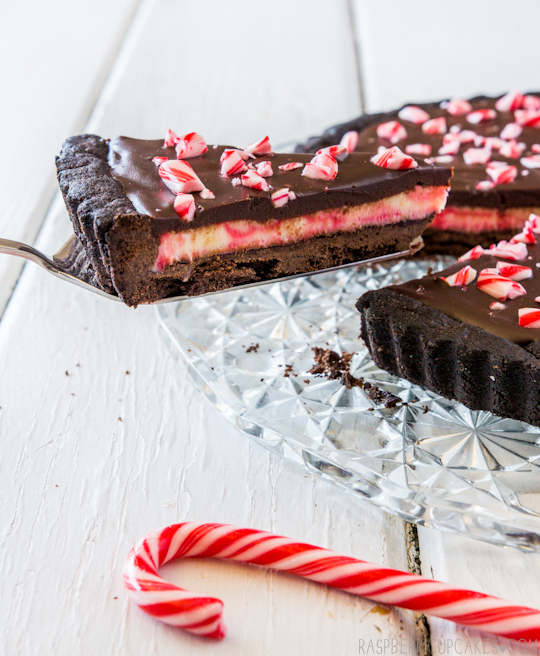 I tried to make the inside filling of the tart match the pretty swirling reds and whites of the peppermint candy cane, by using a peppermint white chocolate ganache swirled with a bit of red colouring. 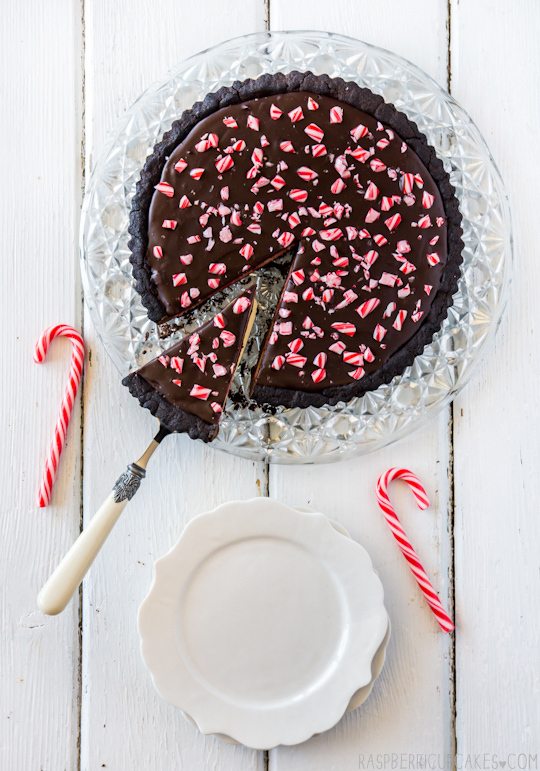 That layer was then hidden under a glossy layer of peppermint dark chocolate ganache (I used the Lindt peppermint flavoured chocolate but you can flavour plain chocolate too) and topped with layer of crushed candy canes. Yep, pretty pleased with how this one turned out. I nearly overmixed the colouring into the white chocolate, which threatened to just turn the mixture into a uniform pink filing rather than a swirling red and white, but luckily stopped mixing it just in the nick of time. 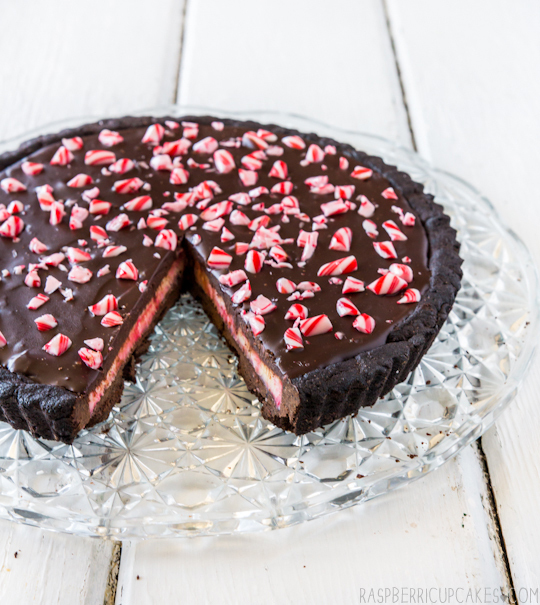 I was a little worried the crushed candy canes might be to crunchy and sharp on top but sitting the ganache overnight in the fridge allowed them to soften just enough to make them pleasant to eat with the rest of the tart. 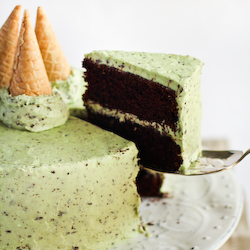 This one is definitely for the mint chocolate fans. I'm a big fan of the combination, but I know there are people out there who don't like it. I'm not judging. 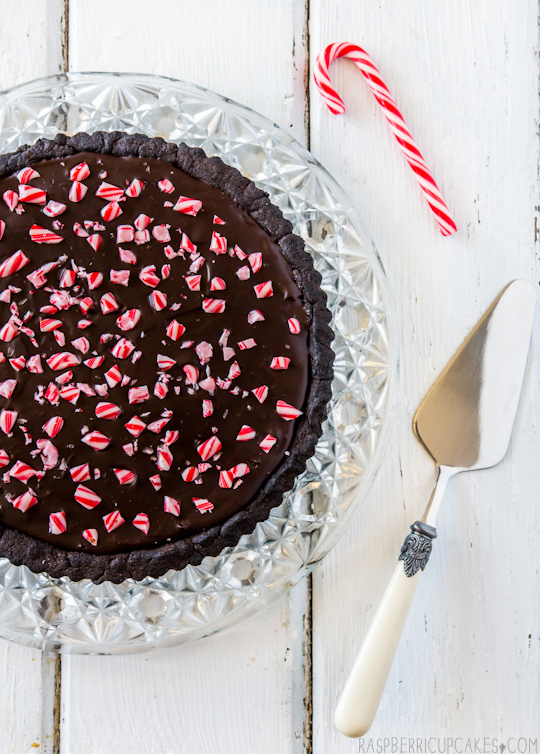 I made sure not to make it too pepperminty, I don't ever want to feel like I'm eating a tart full of toothpaste. I used my adaptation of Bravetart's chocolate tart shell, which I previously used for this tart, and it turned out perfectly. The slight bitterness from the shell goes well with the rich ganache, and I was really glad I split the layers into white and dark chocolate, because I think if I had kept it all dark chocolate it would have been a little bit too rich. But if you prefer your tart filling rich and intense, feel free to use all dark chocolate instead. In other news, you might have noticed on Instagram that A & I bought our first house! It's been in the works for several months and now we are finally about to move in. It's all very hectic and exciting. It however does mean that over the next few weeks I am going to be incredibly busy and possibly without a working oven for a bit. So unfortunately this might interrupt the regularly scheduled Monday posts every week. I'm sorry! I'll do my best to keep it up but if not, I hope that all of you have a fabulous holiday season and a very happy new year! See you on the flip side. Preheat the oven to 180°C (350° F) and lightly grease a 22cm loose bottomed tart tin. Dust the counter with the prepared cocoa/powdered sugar mixture. 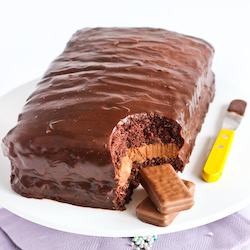 Don’t use flour, it will toughen the dough and dull the richness of the chocolate color. Roll to 0.75cm (1/3") thickness.Carefully set dough over the tart shell and use your thumbs to press the dough into the corners of the pan. Press the overhanging dough against the edges of the tart pan to trim off the excess and leave the dough flush with the edges. Dock tart lightly with a fork. The dough is extremely forgiving and can be rerolled two or three times, you should be able to press any cracks together to mend them. Bake for 20-25 minutes. After 10 minutes or so, check on the tart. If it has formed an air bubble; use a skewer to gently poke a small hole in the bubble to deflate it. Continue baking until the tart is firm and dry to the touch. Cool in tin for about 10 minutes, then carefully remove from tin and cool completely on a wire rack. Shell can be stored in an airtight container overnight. (Note: if you don't want the white chocolate layer inside, simply replace with equal amounts of bittersweet chocolate and pour all the filling in at once) Prepare the white chocolate filling first; place chocolate in a large mixing bowl and set aside. Place 300ml cream in a small saucepan and gently heat until it just comes to the boil. Pour over white chocolate and leave for 5 minutes to melt. 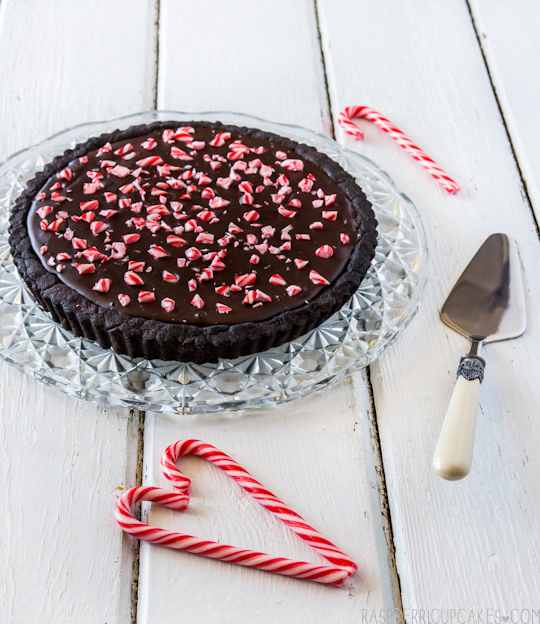 Use a whisk to combine until smooth, then gradually add about 1/2 tsp peppermint essence to taste. Add about 5-6 drops of food colouring in several different spots on the surface of the ganache, or swirl in several drops of gel colouring, then pour mixture into the tart shell to get the swirl effect. (Try not to over stir or the colour will just mix in and turn it pink) Place tart in the fridge for at least an hour or until set. Place bittersweet chocolate in a medium mixing bowl. Place 150ml cream in a small saucepan and gently heat until it just comes to the boil. Pour over bittersweet chocolate and leave for 5 minutes to melt. 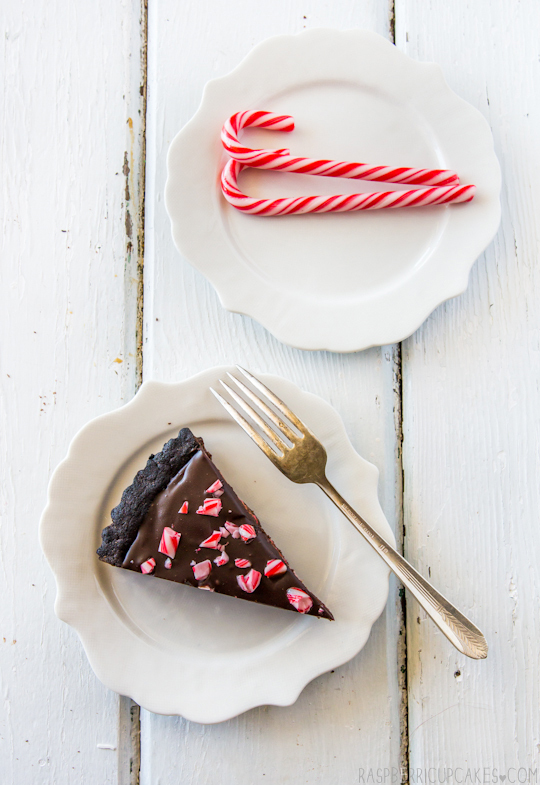 Use a whisk to combine until smooth, then gradually add about 1/4 tsp peppermint essence to taste. Gently pour over the tart to cover the white chocolate layer, using a spatula to smooth the surface. You may not need to use all of it, just enough to completely cover the layer underneath. Sprinkle crushed candy cane pieces over the top and chill in the fridge until set. Remove from the fridge about 20 minutes before serving, use a sharp serrated knife to cut. Can be stored for a few days in an airtight container in the fridge. Yum yum. 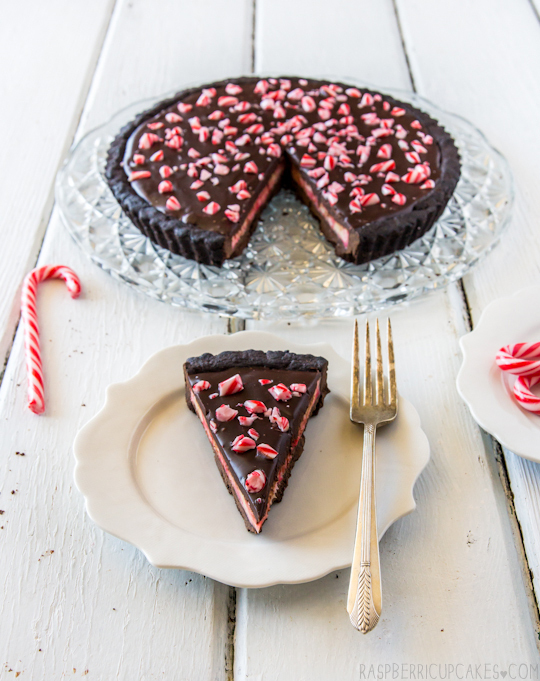 This tart says Christmas!! Call me crazy but I hate candy canes. It's something about the mint flavour that I absolutely despise. 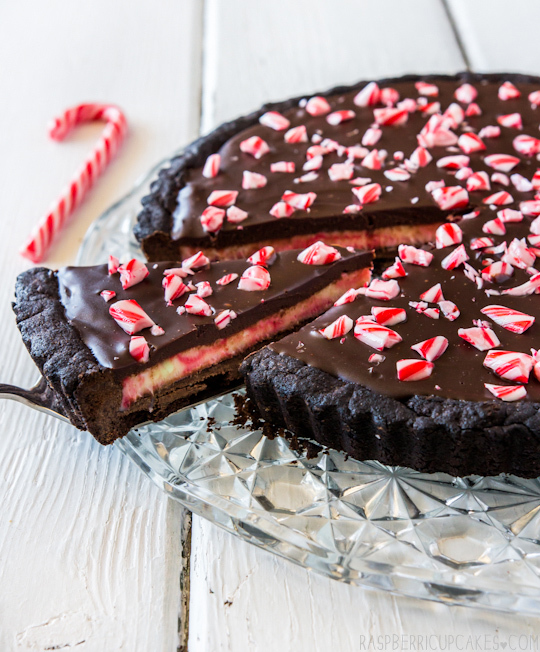 That being said, I think I could eat this tart based solely on the amount of chocolate in it! 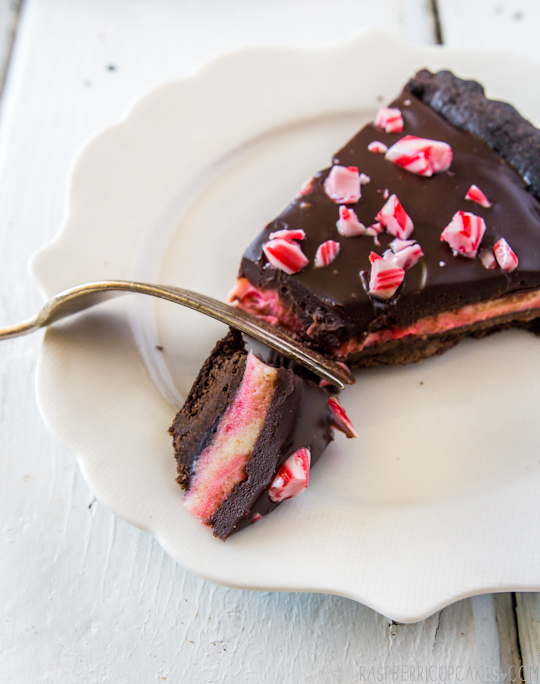 This tart has me drooling right now! I love the swirls in the cream layer and that tart shell, to die for. YUM. 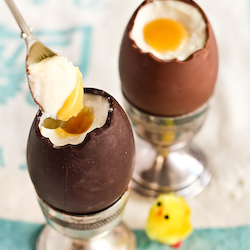 This is SO pretty and looks super delicious! Congrats on buying your first home! That's almost impossible in Sydney! Love it! My household absolutely adore your blog. Everyone comes running to drool over your latest blog inspirations including my 4yo & the dog. Thank you for sharing your sweets wisdom with us. Anything with chocolate and mint makes me very happy. This tart makes me positively giddy. 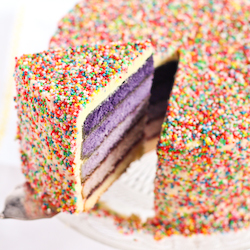 So gorgeous with that marbled filling. Congrats on the new house. So exciting!! Looking forward to seeing what new treats you can create in your new kitchen. Happy holidays!! this is looking so great! i must try it! Wow, I love the layer inside! What a surprise, and how absolutely gorgeous. You are crazy talented! This looks amazing:) Good luck with the new house! lovely pics as usual! merry christmas to you, loving all your festive posts! omg this looks so awesome! And congrats on your new home! This looks fantastic! I really want to try this out straight away!